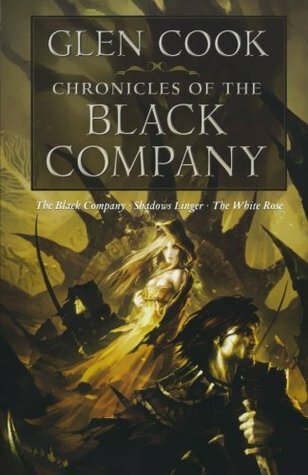 Chronicles of the Black Company (1-3) is a very unique, dark, violent, and engaging fantasy book. It follows a group of mercenaries, the Black Company, through an ongoing war with the Lady and the Rebles. Though the beginning of the book is confusing because the Company is really unaware of where they are fighting or who they are fighting for, they eventually follow the Lady and the book becomes easier to read (after a few chapters). The book is written in first-person in the form of annals by Croaker, the Company’s physician and annalist. After the first book you get to read from Croaker’s point of view, as well as a few others. I loved the unpredictability of the novels. I could rarely guess what was going to happen and when I did I usually ended up being wrong. There are many twists throughout each book,which really kept me interested, and the ending of the third book was a huge surprise. I never saw that coming! There is also the non-existence of the typical fantasy stereotypes such as fairies, dragons, swords, or the boy who becomes a wizard, that make this book even more interesting. Instead there are just normal war-going men with a few of them who know how to do a little magic. It brings the story down to a more human level. The novels are more character detailed than scenery detailed due to the writing style. As a result, many of the characters (probably about ten) surrounding Croaker are very well developed, and the others are pretty vague. The characters have distinct personalities and are extremely fascinating. A couple of the characters are even hilarious. After the first book there are a few more details about people and places because there are a few extra people telling their stories as well.The interesting aspect of these novels is that the main characters are bad guys (due to their actions) instead of the good guys that many fantasy novels follow. I think Glen Cook is a talented writer because he makes me fall in love with these characters even though I know how cruel some of them are. Due to the writing style there are some gaps in the knowledge about some of the characters in the story on the other side of the war. Since we only follow the black company, very little is said about the history of Rebles, the White Rose, or the Circle of Eight that are mentioned throughout the books. I really enjoyed these novels and I cannot wait to continue the second volume! I would recommend reading the entire volume, and to anyone who loves fantasy, a bit of magic, and is over 18 years old. On other note, I wish there would have been a map to follow while reading the book. There are so many different places that the Company travels it is hard to keep it all straight and I believe that a map would really help in following the story. I agree. It really is a bizarre series though I couldn’t help but like it–especially the last book! That ending was great!